Caring for a new baby can be fraught with difficulty—even more so for a mom living with stressful family dynamics or other uncertainties. Now a Cummings School researcher has shown how stress and hormone levels impair a mother’s ability to fully care for her offspring—work that could lead to new ways to prevent or treat the postpartum depression experienced by 9 to 16 percent of human mothers. Ben Nephew, a reproductive biologist who specializes in maternal behavioral disorders, says his research uses the behavior of female rats that have just given birth to draw broader conclusions about stress levels and well-being of mothers and their offspring. He creates social stress by introducing a different male rat into a new mom’s cage each day. To protect their young, the mothers become aggressive, and so in addition to being exposed to conflict, the rat pups receive less attention from their moms. “This type of exposure is very similar to a human situation where there is social stress in the family that adversely affects maternal behavior,” says Nephew, who earned his doctorate in biology from Tufts. The anxious behavior also affected the pups’ ability to thrive. The pups who were exposed to the male intruder weighed 9 percent less at 70 days of age than the control pups, a sign that they were getting less milk from their moms. The effects of stress on one generation of mothers can also impede their daughters’ maternal abilities, Nephew discovered. To gauge the relevance of his rat research to human mothers and their children, he consulted with Kristina Deligiannidis, an assistant professor of psychiatry and obstetrics and gynecology at the University of Massachusetts Medical Center who specializes in postpartum depression. The most severe cases of postpartum depression and anxiety are seen in women who have experienced chronic stress throughout their lives, not just after giving birth, she says. To test that theory, Nephew looked at the maternal behavior of female offspring exposed to social stress as pups. He draws a parallel with human children who have experienced family conflict both firsthand and indirectly as a result of the lack of attention they received from their mothers. He found that the second generation of mother rats also had trouble caring for their young and experienced anxiety and impaired lactation—even though they were not exposed to male intruders after they had given birth. Nephew found a potential cause of this phenomenon in the hormones oxytocin and prolactin, which affect maternal care and milk production. 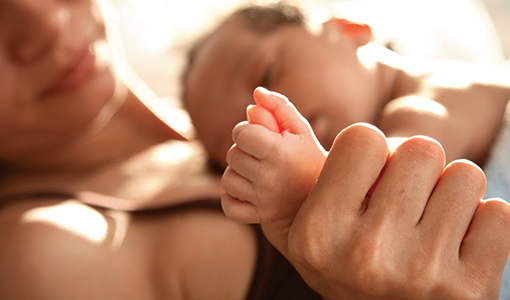 The second-generation mothers had lower levels of oxytocin and prolactin in the brain and less prolactin in the blood. “That really indicated that there was some kind of impairment in their ability to regulate nursing at the level of the brain,” says Nephew. He theorizes that because the second-generation moms were exposed to stress early on, it impaired the development of the mechanisms that control these hormones. The good news is that after a week, the second-generation mothers seemed to compensate and spent more time grooming and nursing their pups. Nephew speculates that the mothers may have responded to some form of ultrasonic vocalization from their pups that they need more milk. Nephew’s most recent data indicate that the regulation of prolactin and oxytocin and the social behavior of both male and female rats from the third generation are also impaired, supporting observations of increased risk for depression, anxiety disorders and autism in the children of human mothers exposed to stress early in life. The research, published in the journals Stress, Psychoneuroendocrinology and Hormones and Behavior, has direct relevance to human mothers, says Nephew, because it may finally provide a more behaviorally relevant way to assess new preventive measures and treatments for postpartum depression, anxiety and nursing difficulties. Working with Deligiannidis, Nephew is looking at both synthetic hormone replacement therapies and natural methods of manipulating hormone levels to determine their effects on postpartum depression in rodent moms.